The attack which left Irish Olympic boxing medallist John Joe Nevin with a broken leg happened when he attempted to intervene in a dispute in his extended family, his trainer has said. The assault on Nevin in Mullingar is likely to keep the London 2012 silver medallist out of boxing for some time. 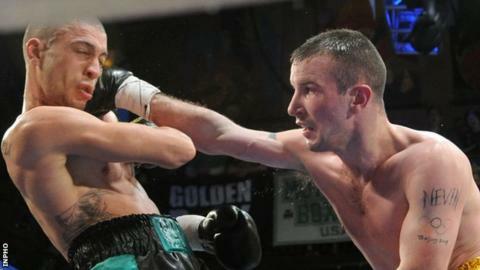 "He went to mediate and try to get things settled," Nevin's trainer Brian McKeown told Irish broadcaster RTE. "As far as I am aware, it was a dispute in the extended family." Nevin's leg was broken in two places and, after already undergoing surgery over the weekend, he was expected to have a further operation in Tullamore on Monday. McKeown said that Nevin, who won his first professional bout in the USA last month, had called him directly after being attacked. "Obviously he was in a state of shock. He told me that he had been attacked and that his leg had been broken. "The bone was sticking out of his leg at that stage. It was an awful happening." Despite the assault, McKeown is convinced Nevin will return to boxing, possibly even before the end of this year. "John Joe has been a fighter. He's overcome bigger battles than this. "I feel he has the character and commitment to overcome it. "His management team agree and plans are being put in place for when he's released from hospital, that he'll go to America for rehabilitation." Nevin defeated Cuban world champion Lazaro Estrada-Alvarez on the way to reaching the Olympic bantamweight final in London before losing the decider against Britain's Luke Campbell.